I love the Key of the Tamed Beast. It's really harsh and sad and you could use it for any species, actually. I was thinking more in line of the Key of Civilization that shadowcourt posted, but with all this options, I'm already seeing a chronicle taking place in Goren and Southern Maldorn, a tale of slave Wulfen, feral defenders of the homeland and "civilized" wolves in the midst. A very interesting idea. 3 XP: Every time you favor civilization over the wild in your actions, even for the worst. Buyoff: Refuse the creature comforts of the civilized world or completely embrace civilization. Since I got this picture for the upcoming book release of the german translation, I wonder how and if Vulfen and Urgoblins could relate. Maybe I should start a thread on the goblin subspecies. Its certainly a fun image. Though I guess I was never quite explicit about it, my sense of the vulfen was to skew farther from the "they're like people with wolf-heads" vibe that some fantasy games go for, and really assume that they were like large wolves, and predominantly stayed quadrupedal. Hence the mechanics around their 1 Reason cost to even use their hands/bodies in normal ways, and the necessity of Fetches and the like. Granted, it means a lot of fantasy art out there doesn't really come close, unless you start looking at some of the more bestial werewolf art. But that's only one interpretation; I'm sure there are plenty of people out there who imagine ratkin as more or less feral than their fellow players do. In fact, I'm probably guilty of "de-dog-ing" the goblins in my regular TSOY games more than I should. We play up the polymorphous aspects of goblins so much, particularly in light of their adaptability, that the canine features often fall by the wayside in favor of more classic fantasy gobliny-ness. 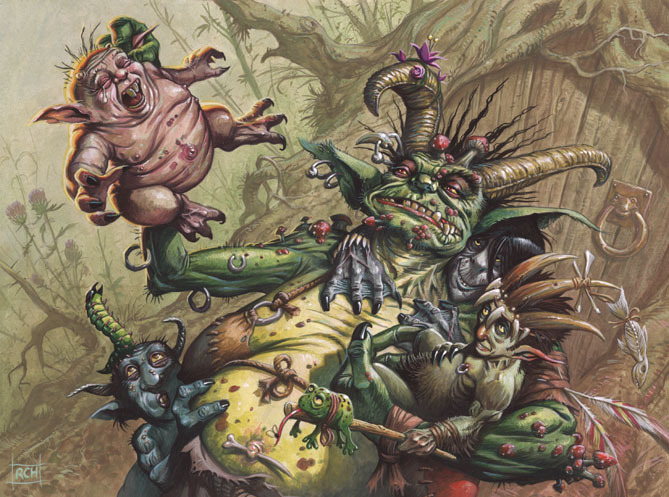 As such, I suspect my goblins look more Brian Froud's creations (a la "Labyrinth"), or some of the Lorwyn variegated types of boggarts (in all their shapes and sizes) than Clinton ever intended, but that's okay. The lovely thing about gaming is that whatever works for you and your group is fine; the Role-Playing Police very rarely come and arrest anyone. Starting a general thread on goblins is a fun idea, if you have stuff to share. I wrote two little Secret categories for them for my own game which included the ideal of Collectivist Secrets (for goblins who want to explore their mutable identity in the terms of group cohesion--heavily inspired by Clinton's "We Are Gigantus" reference in "Yesterday's Heresies") and Trader Secrets (me going crazy on the idea that a cool axis for goblin supernatural crunch could be their mercantile/swapping nature, allowing you to do all sorts of weirdness like swapping Secrets and pool points and Ability scores with other folks--basically taking Adaptability out to its ultimate potential).I'd happily post some of that stuff if you thought it was useful to yourself or others, and I'm reasonably sure a goblin crunch thread would make Eero come swinging in on a rope with a sword between his teeth and all sorts of goblin awesomeness as well.